Oatmeal, twigs, rocks and pieces of shoe. These are the type of inanimate objects that talk to Kaye Gray-Manolov. And she gladly keeps the conversation going. She collects an odd assortment of these objects, storing them in her dining room/art studio. When she gets a few free moments, she digs them out of their cardboard boxes and breathes life into them, transforming them into mixed-media art. 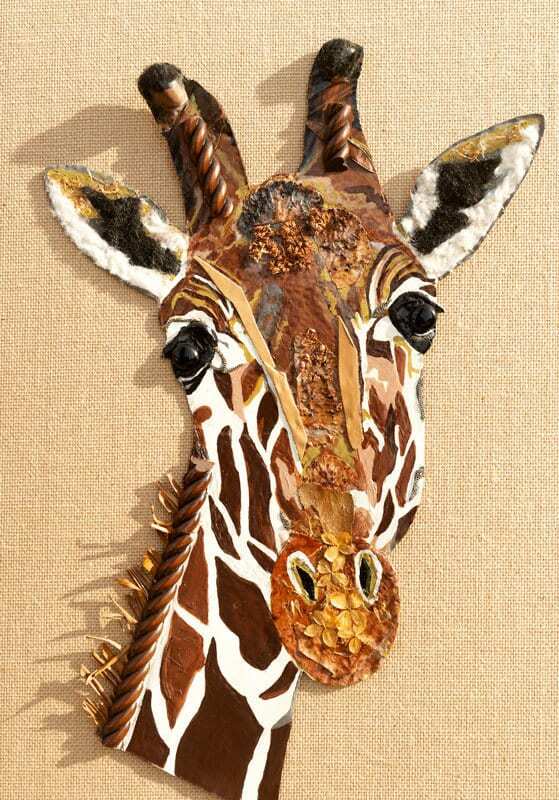 Her specialty is 3D animals, each a one-of-a-kind creation with its own personality. Although she creates them, the animals seem to have popped into this world from another magical dimension. Holding a curved rock in her hand, Gray-Manolov says, “This rock speaks to me. It says ‘ear.’” She eagerly reaches into a box and takes out several other items she has picked up: a black half-ring from a caulk tube, part of a soccer ball. “This is from an old rug that I threw out, and this rubber mulch is my friend,” says Gray-Manolov. Gray-Manolov describes herself as being “very hyper, nervous and anxious.” She’s uninhibited in her art and her conversation. She’s earned the right to be blunt and to say what she thinks. At age 52, she’s put up with chronic pain and a slew of medical problems for much of her adult life. While in her 20s, she was diagnosed with thyroid disease. Then two back-to-back car crashes damaged her neck and back. On top of those injuries, she slipped at a grocery store and fell, compounding her previous physical problems. “It was like having another car accident without a car,” she explains. The pain these days is constant. “I can’t run, jump, garden. Nothing about my body is stable, and everything hurts,” she says. She isn’t complaining or looking for sympathy. She’s just honestly explaining what her world is like. It just happens to be a world of frequent, expensive trips to physical therapists and doctors. But her physical limitations don’t stop her from enjoying her family, her art and her work as a paraprofessional with Columbia Public Schools. She and her husband, Roumen, have two tennis-playing daughters, Mirra, age 14, and Mena, age 10. The family spends a lot of time travelling to the girls’ tennis tournaments. Although she always liked art, she didn’t grow up thinking of herself as an artist. “Art was the only subject I loved other than lunch and being outside. I realized at West Junior High School that art was my passion, the only thing I truly felt I was meant to do,” she says. After graduating high school, she temporarily put aside her love of art, and in college studied practical subjects, such as psychology. This led to a variety of different jobs and work as a substitute teacher in Columbia schools. She found she especially enjoyed working with special needs kids. But she was still dissatisfied, feeling that she wasn’t reaching her potential, wasn’t the person she knew she could be. That idea of making three-dimensional animals developed into a series of art projects and then into a part-time business. 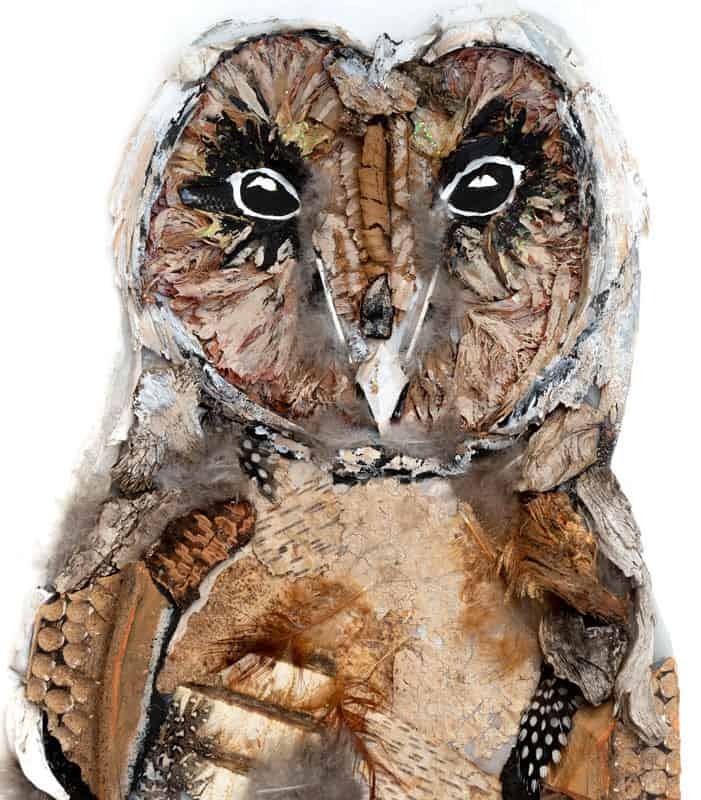 The animals that Gray-Manolov envisioned would be made out of found or recycled materials. She started with a zebra. For its mane, she used parts of piano keys. From the zebra, she moved on to other animals — a lion, a tiger, a giraffe, an owl, a pig, a bear, a monkey — a menagerie of imagined animals. Her creative process is spontaneous but time-consuming. Typically, her art begins with a walk. When something catches her eye or speaks to her, she picks it up and carries it home. Then, the experimenting begins. Sometimes an object fits perfectly into one of her projects, like a missing puzzle piece. Other times, what seemed like a great object doesn’t work. And occasionally, she searches for specific items. Currently, she is waiting for a niece to bring her a handful of hair from her newly shaved dog for possible use in a lion she is creating. Once she finished several of the animals, Gray-Manolov’s friends encouraged her to start selling her creations. Before long, a friend helped her convert photos of her animals into stationery cards. Kaye created a company and Facebook page, Cuckoo Creations Art, and began marketing the cards along with t-shirts. Currently her cards are in eight local stores, including both Clovers and the MU bookstore. An assortment of her animals are on display at the Broadway Urgent Care West, near the corner of Stadium and Broadway. A close look at the animals in the urgent care display reveals some of the clever details Gray-Manolov includes in her animals. Pushing a bit of fur off a lion’s chin, She points out a puzzle piece, glued on. The top of an owl is actually a strand of leftover caulk. The bear’s head is mostly pine cones and wood. 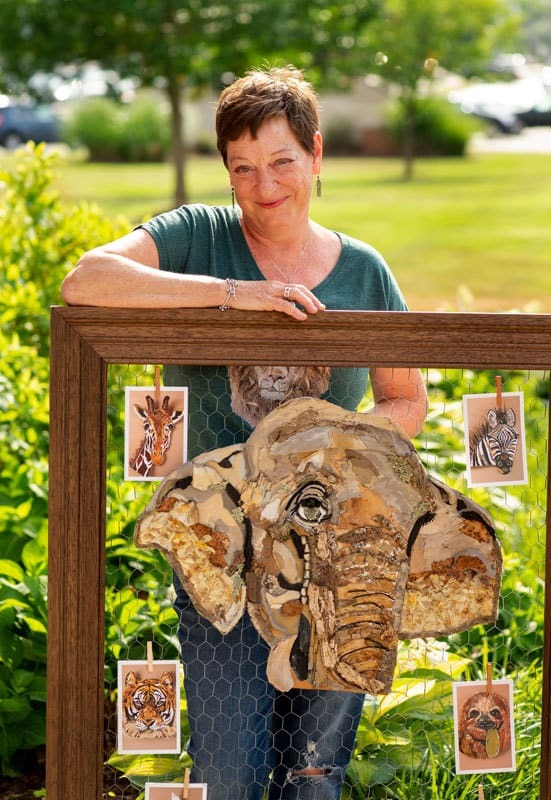 Her animals are as easy to recognize as her unique creations. They look out at the world as representatives of a playful imagination. Some art is dark and brooding, but not Gray-Manolov’s. Her animals bring delight and a sense of beauty wherever they are found, whether on a card, a wall or on a t-shirt.